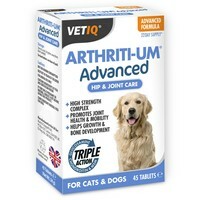 VetIQ Arthriti-UM Advanced Care for Cats and Dogs has been specifically developed for the maintenance of healthy bones and supple joints. Made with a high strength complex of active ingredients, VetIQ Arthriti-UM Advanced contains essential amounts of Glucosamine, Chondroitin Sulphate, MSM and Green Lipped Mussel. Providing nutritional support for ageing joints, this combination of ingredients helps to support and maintain mobility in joints and the overall condition and flexibility of your pet.